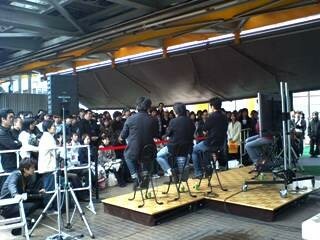 Thanks for coming to "The Black Mages event at TOWER RECORDS Shibuya" on April 19th! We were surprised that almost 300 people came too see the TBM members. Unfortunately, it was a windy and cloudy weather, but did you had fun? And there's other information for the TBM fans! We decided to put on the live show of THE BLACK MAGES on Aug.9th 2008 at Yokohama BLITZ! The name of the concert is "THE BLACK MAGES III Darkness and Starlight LIVE". Please check the details 【Here】!